Another fantastic construction by the creative genius Antonio Gaudi, Casa Mila, commonly known as La Pedrera, was the last civil work that Gaudi undertook before dedicating all his time to the assembly of La Sagrada Família. The building is a UNESCO World Heritage Site and demonstrates the signature style of Gaudi with elaborate designs, globular shapes, assorted sculptures, colourful tiles and intricate details. 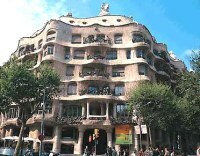 Built between 1906 and 1912, the distinct architecture of La Pedrera and her counterparts was unconventional and unheard of in the popular Spanish architecture of the time. The remarkable building is now a cultural centre that organises a range of activities and hosts exhibitions of various kinds. Areas open to visitors include: the roof, providing lovely views and a close look at the weird and wonderful architectural elements on top of the building; the Espai Gaudi, an attic space dedicated to an exhibition on Gaudi's life and work; the La Pedrera Apartment, an area that recreates the home and lifestyle of a bourgeois Barcelona family in the early 20th century; and the spectacular courtyards and exhibition rooms of the first floor. Guided tours are available, in multiple languages, but these must be arranged in advance. Address: 92 Paseo de Gracia. Opening times: Daily 9am to 6.30pm (4 November to 28 February); daily 9am to 8pm (1 March to 3 November). Admission: €16.50 (adults), €8.25 (children aged 7 - 12). Concessions available.